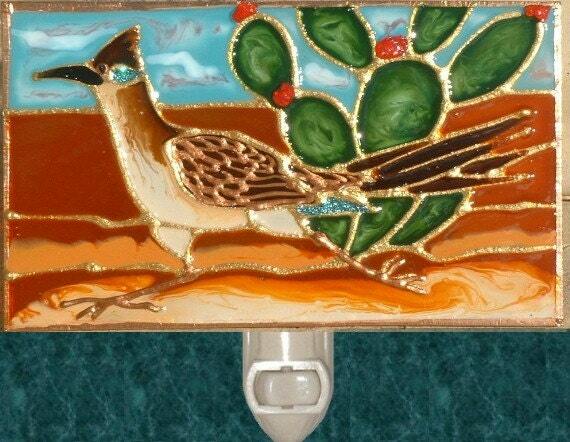 We love creating Old West and Southwestern nightlight stained glass decor and travel to the Arizona and Mojave desert quite often. We really enjoy totally immersing ourselves in the rich scenery of the old wild west and our Southwestern designs are inspired by the fine-art galleries we visit while there. The Arizona cactus design is our own creation of a beautiful Sedona desert landscape bathed in the reds and golds of the warm desert sun. For the kokopelli and cow skull designs, the browns and tans were blended so they emulate well-worn leather or the aged parchment of an old book. The turquoise of the chilis night light is painted with several different shades of turquoise to resemble the actual stone. As always the colors can be changed at no extra charge.